Versatile for many applications, uses for brush coils and cylinders include: Cleaning industrial conveyers - Wiping bakery belts - Washing golf balls - Applying paint - Sweeping roads - Washing fruits and vegetables - Peeling potatoes... just to name a few. 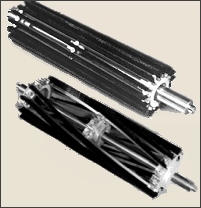 Coils are mounted on shafts and can be motor driven, or for cleaning conveyors the can just run passively allowing the belts to rotate the coils. A line of standard coils, shafts and bearings are available. They include 3 1/2" and 4" diameters, up to 36" long, in soft, medium and stiff nylon fill material. Please us contact us for details. Straight or spiral brush strips are mounted onto special designed mounting hubs with standard arbors. Cylinder brushes are very a cost effective alternative to full face coils. Various hubs are available holding from 6 to 16 strips. The brushes are very easy to replace and are available up to 122". A line of standard nylon brush strips and mounting hubs are available, please contact us for details. For larger outside diameters, coiled brushes can be mounted on a metal cores. The structural strength of a core also allows for longer brush lengths where a smaller diameter shaft would bend. Have questions, need help? Contact Us!